Many organizations are participating in the effort. Beelieve, Beyond Pesticides, Beyond Toxics, Center for Food Safety, CREDO Mobilize, Friends of the Earth Canada, Northwest Center for Pesticide Alternatives, Organic Consumers Association, Pesticide Action Network, SumOfU,s and the Xerces Society for Invertebrate Conservation will all have representatives for the bees showing up at Home Depot and LoJoinwe’s. But it doesn’t end there. Participation is nationwide, too. From Chicago to Minneapolis, San Francisco to Oregon, people involved in “BeeAction.org’s” campaign want retailers to stop selling neonicotinoids — the most widely used class of pesticides in the world. There is a growing heap of evidence that supports a theory linking bee death to this pesticide. When you also consider the recent scientific studies showing monarch butterfly decline due to the use of RoundUp and the near instant death of bees who consume RoundUp chemicals in flower pollen, why would anyone want to keep selling these chemicals? The FDA seems to have ignored this fact, so it rests on consumers to put things right. Just last year, bee keepers reported losing 40-100 percent of their hives due to bee die-off. With the crazy weather we’ve experienced lately along with the pesticide Armageddon bees and other pollinators have to endure, its no wonder they are dying in droves. Furthermore, a groundbreaking pilot study released last summer proved that many bee-friendly garden plants sold at Home Depot and Lowe’s contained neonicotinoid pesticides, yet they sold them to customers without letting them know. It isn’t just the bees that are being affected by neonicotinoids, though. The European Food Safety Authority cited evidence that two neonicotinoids, acetamiprid and imadacloprid, “may affect the developing human nervous system” of children, and they recommended further restricting their use. The UK’s top garden retailers, including Homebase, B&Q and Wickes, have voluntarily removed neonicotinoid-containing products from their shelves. 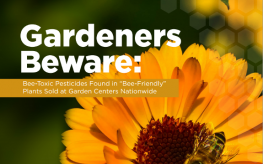 The Bee-Action Week supporters also want retailers to stop pre-treating plants with pesticides, and also to stock more certified organic plants for consumer purchase. The EPA won’t even look at neonicotinoid pesticide use until 2018, despite the fact that there is growing evidence these chemicals are poisoning the planet. Also, despite the fact that over a million people have commented publicly that bees need protection. Last year, U.S. Representatives John Conyers (D-Mich.) and Earl Blumenauer (D-Ore.) introduced the “Saving American’s Pollinators Act,” but it can’t be passed until the FDA puts their two cents in. Instead of just giving your sweetheart some love this Valentine’s Day, show some support to the bees by sending people Lowe’s and Home Depot a Bee Valentine. All our ‘two cents’ adds up to millions. More of the, “capitalism is good,” fraud! Capitalism is fast becoming death and despair for everyone and everything but the wealthiest. I delivered some valentines to my local Lowe’s and Home Depot. We need more people involved in this, instead of the distractions that they consider ‘life’. If they don’t pull their head out of the sand, soon, there will no longer be any life worth living left on this planet.